The eye exam where you can’t see the technician’s lips (or any face-part) because of the lights are inyour eyes? The masked dentist who’s clearly trying to ask you something but you can’t say ‘pardon’with a mouth bolted open by metal bars? The doctor in a rush who doesn’t make eye contact? These situations are the tip of the ‘healthcare communication barriers’ iceberg. You’d think that doctors and other health professionals wouldknow, instinctively, or at least have beentaught, how to communicate with us. The truth is, they are just as likely to break our rules of engagement as any random, untrained person. 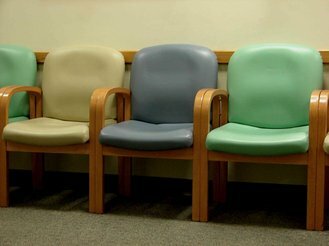 What’s more, the average healthcare environment is usually not an accommodating one. But we should never, ever, have our health compromised because of hearing loss! While many health issues are beyond our control, we do have a say– and a responsibility – in creating effective communication. We can take the lead by identifying the problem (this examining area is too noisy for me to hear you well) and some solutions (speak up, Doc, and/or write it down!). Keep reading this article on my site The Better Hearing Consumer ….